In the Manjimup-Pemberton area, potatoes are grown in rotation with a 4-5 year pasture phase comprising 2-3 species. By increasing species diversity and introducing a perennial component, we aim to improve year-round pasture productivity, increase rooting depth, increase soil organic matter (SOM) and enhance soil microbial activity. Greater duration of cover will reduce erosion and improve feed supply. Increased rooting depth will improve water and nutrient interception. Higher SOM will improve nutrient retention, soil structure and maintain soil pH. The overall outcome will be greater productivity in both crop and pasture phases and improved soil health and water quality. The overall aim of this trial is to utilise the symbiotic relationships between diverse plant species with soil micro flora and fauna to improve soil condition and increase productivity. A range of variables will be assessed to demonstrate improvements achieved by the treatment sites in comparison to control sites (usual practice). The Ryans compared a new mix of different species to usual practice (oats, rye and clover) to see what would grow really well over autumn/winter and survive through summer and autumn. The new mix was seeded in February 2014 and irrigated to get it going. Initially purslane was a dominant species in the more disturbed areas where the irrigator turned around but it was soon outcompeted. By early May 2014 the most dominant species from the mix were the spring/ summer annuals millet, leafy turnip, sorghum, sunflower and faba bean, albeit much different varieties to the usual rye, oats and sub clover blend. Cattle were introduced in May 2014 and were initially reluctant to graze on the “strange” feed and showed preference for their usual rye/clover and oats. However, after a few introductions they thought it was great. So great in fact that they pushed over the feed cages and ate the contents. There were signs that at times the soil was too wet for grazing and cattle were left in too long due to an accident on farm. By late spring 2014, a large difference in diversity was evident in the treatment areas. This had been a gradual change. Chicory, arrowleaf clover, ryegrasses, lucerne, phalaris and leafy turnip were now the dominant species with some regrowth of millet. Fescue and cocksfoot were not yet obvious. Rye grass was dominant in the control areas. Bare patches were visible across all areas in the trial where cattle had damaged the soil in the wet winter conditions. In autumn 2015 the Control was dominated by ryegrass and the Treatment predominantly lucerne, ryegrass and chicory. The area was locked up for hay in early September 2015 and harvested in November. By late November 2015 lucerne had made a good recovery in the Treatment whereas there was little growth in the Control. Over the next few months lucerne continued to dominate until the winter rains kicked in. In 2016 cocksfoot, ryegrass and white clover were more dominant with lucerne still apparent and by autumn 2017 the grasses and clover dominated. The trial was finalised in May 2017. The major benefit was that it enabled the Ryans to determine what perennial species worked on the farm. Visually it was easy to see the differences between the more diverse pasture and the rye, clover and oats. These differences became more obvious as time went on. Some species thrived in the conditions and others like plantain, fescue and panic didn’t germinate at all, while still others like lucerne and cocksfoot took time to find their niche. 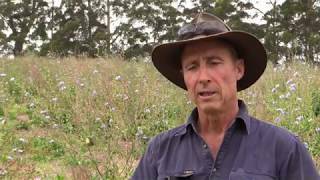 Lucerne got its roots down deep through the compacted layer and proved to be a beneficial addition. The use of millet, sorghum, leafy turnip, sunflower and faba bean sucked up a lot of nutrients and this may have been the driver for the better biological results in 2015. Additionally, leafy turnip also penetrated the compacted layer and sunflower is recognised for its large root system and ability to soak up nutrients. Overall, there were some valuable lessons. If the trial was repeated, it would be better to use two comparative areas rather than replicated small area trials – for ease, logistics, economics and time savings. However, in saying that, the replicated data has demonstrated that overall the changes in levels of TOC were significant but the comparison between the impacts of the different inputs on TOC were not. This in itself demonstrates the soil restorative power of a pasture phase. pH and cation levels appeared to be more stable under the more diverse species mix. Benefits to the microbial biomass C, N, P and DOC were significantly greater where the more diverse mix was used. Information from this trial is being actively used by the Ryans to improve pasture diversity and soil health between rotations and in their long-term pasture systems. An important consideration is cost of seed, so some species will be used in long term pasture as they are too expensive to use in the short-term pasture phase, and the cheaper varieties can be incorporated onto the potato/pasture rotation. Generally, comparative soil sampling is not undertaken in day to day farming, and trials like this provide an opportunity to explore what is going on in the soil rather than merely judging from above ground visual inspection. The results of this trial suggest that there are definite benefits to using more diverse plant species in rotation and more work in this area is warranted. The knowledge gained is transferable to other crops besides potatoes that Ryans are now growing. The cattle are performing very well on the multi-species pasture, especially now they are used to the change in their diet. The practice has been implemented across the whole farm.